The Peak District is made up of two areas The White Peak which is a limestone plateau of green fields with rolling hills and many dales and The Dark Peak (or High Peak) which is a series of higher, wilder and boggier grit stone moorlands. The Peak District is also known as the Derbyshire Peak District and also covers areas of Greater Manchester, Staffordshire, Cheshire, West Yorkshire and South Yorkshire. Although there are no prominent boundaries the central and most rural area of the Peaks lie within the Peak District National Park. The Peak District National Park Authority provides public facilities such as car parks, public toilets, visitor centres and also maintains the rural nature of the park although most of the land is still owned by the traditional landlords. There are many outdoor activities to participate in from walking, climbing, cycling, horse riding to visiting the country houses and gardens, parks, exhibitions and much more. This year, 2012, the National Trust’s Peak Districts Wardens are being renamed Rangers and they are there to help people enjoy and benefit the land. The overall aim of the National Trust is to rekindle the nation’s love affair with nature and the outdoors as well as look after the land they own on behalf of the nation. If you see any of the Rangers in their new uniforms they will be more than happy to help you get the most from your visit. The Manifold Valley although in North Staffordshire is still in the Peak District. It is a lovely steep sided valley with the River Manifold running through its bottom. The river, known for its limestone beds, rises on Axe Edge near Buxton and flows south for 12 miles parallel with its sister river the River Dove to where they both meet at Ilam. In the summer the river from Wetton Mill to Ilam disappears underground so the river bed is more often dry than wet between May and October, except when in spate, and its major tributary the River Hamps also disappears underground and the water from both rivers reappears at the boil holes near Ilam then flows again for a short way before entering the River Dove. The Manifold Way, which opened in 1937, is an 8 mile long distance tarmac footpath and cycle track which can be used by horse riders from Hulme End in the north to Waterhouses in the south and in parts the path follows close to the river. The path is part of the former route of the narrow gauge Leek and Manifold Valley Light Railway which operated between 1904 and 1934 and the old station at Hulme End is now the Manifold Valley Visitors Centre. The railway was mainly to provide rapid transport of milk and dairy products from farms in the valley to customers in Leek and The Potteries. The line also transported the copper being mined at Ecton. The limestone cliffs that fringe the valley have some amazing rock features, caves and rock climbing areas. Wetton Mill, now a popular tourist attraction, was a water mill for grinding corn and closed in 1857. The mill sits on the Manifold Way has now been converted to create a beautiful picnic spot, cafe and two National Trust Holiday Cottages. There are still some remnants of the mill such as the limestone outhouses, the bridge that was built by the 5th Duke of Devonshire in 1805, the impounded section of the river that was the mill pond, the mill stream and a grindstone. Just above the mill there is a cave with several mouths and the centre open to the sky. There is parking and toilets and the cafe is also popular with walkers using the Manifold Way and other rights of way. Wetton is a village in the Peak District National Park, North Staffordshire located at the top of the east side of the Manifold Valley. Because the post town is Ashbourne, Derbyshire tourist information can wrongly described Wetton as being in Derbyshire. The village houses the Church of St. Mary which was rebuilt in 1820 but the tower is 14th century and an inn the Ye Olde Royal Oak both are next to each other near the village green. Ecton is a tiny hamlet and like Wetton is in the Staffordshire Peak District and situated below Ecton Hill on the Manifold Way. Copper and lead mining was the main industry in the Manifold Valley and the mines were some of the richest in the country. The mine at Ecton was the deepest and one of the most productive copper mines in the country once owned by the Duke of Devonshire. It is said he made a fortune in the 18th century which he used to finance Buxton’s majestic crescent. The copper and lead deposits on Ecton Hill were worked for over 3,500 years until 1891 when mining at Ecton stopped. The old spoil banks and the old engine house can still be seen at the famous Ecton copper mine and due to Natural England’s funding the engine house is to be repaired. There is also evidence of mineral mining thousands of years ago due to the discovery of Stone Age implements found in some of the caves. Hulme End a small hamlet just over a mile north of Ecton was once the terminus of the Leek and Manifold Light Railway and its old station building has been restored and is now a visitor centre with toilets, picnic area and car park and also from here is where the Manifold Way starts. There is also a pub by the bridge once called the Light Railway but is now called the Manifold Inn. Thor’s Cave is a natural cavern and classified as a Karst cave. 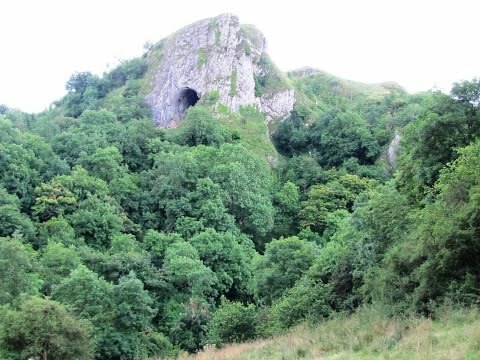 The cave also known as Thor’s House Cavern and Thyrsis’s Cave is set in and near the top of a steep limestone crag in the Manifold Valley with an entrance of 10 metres high it can be clearly seen from the valley bottom. At the base of the cave, about 80 metres below, there are a number of small caves just above river level which can only be reached when the river bed is dry. The cave has been used by rock climbers since explorations in the early 1950’s and can be reached over the fields from Wetton or from the Manifold Way via a lot of steps. Excavations in 1864 to 1865 and 1927 to 1935 found human and animal remains, stone tools, pottery, amber beads, bronze items and burial sites of at least seven people. The excavations have also shown that the cave was occupied as long as 10,000 years ago from the end of Palaeolithic period with more intensive use during the iron age and Roman periods making it one of the oldest sites of human activity in the Peak District. Thor’s Cave was used in the filming of The Verve’s 1993 video for their single “Blue” and is pictured on the front cover of the band’s first album “A Storm in Heaven”. The cave was also used as a location in the 1988 film “The Liar of the White Worm” directed by Ken Russell and starring Hugh Grant. We park in the car park at Weag’s Bridge between Wetton and Grindon and walk along the Manifold Way with the River Manifold on our right passing Ladyside on our left and below Thor’s Cave until we come to a bridge over the river. We cross the bridge and at the road we cross over diagonally right and take the footpath through a gate at the back of the little car park sign posted Wetton Hills. We walk through the valley for about a third of a mile and take the footpath on the left following the blue arrow uphill. At the top we turn right at another signpost with a blue and yellow arrow and after a few minutes as we go over the brow of the hill we can see Wetton Mill below. We make our way across the top to have a look at the cave before we go through the gate down to Wetton Mill. At the mill we make our way to the bridge and take the track with the river on our left. We walk forwards and turn left at the farm sign posted Hulme End 2½ and continue on the track through the gate. When we come to the road we turn right and follow the road until we come to a t-junction with a bridge on the left we turn sharp right onto a track going uphill sign posted Top of Ecton ¾ and Wetton 2¼. At the top we turn left in front of the building following the arrow after a short way we go through the gate and head straight forwards sign posted Ecton Hill Manifold Valley. We head forwards uphill passing a barn on the right and bear right at the top keeping the wall on our left towards a building. At the building we turn left through a small gate with a white arrow at the side of a big gate and turn right with the fence on our right. We walk forwards crossing the field to go through another gate and keep heading forwards with the wall on our left and some old mine shafts on our right. At the end of the wall we make our way across the field to the old disused mine workings then head downhill following the sign for Wetton. We go through the gate and turn left onto the road going downhill and turning left at the hairpin bend. At the building and footpath sign on the right we turn right down a very muddy path until we come to a gate on the left. We go through the gate and cross the field slightly going downhill to cross a bridge over a stream and then bear right. We keep walking forwards towards the dip in the hills passing a large blue public footpaths sign towards Wetton. We pass over a stile and bear to the left slightly uphill to go over another stile with a barn down below on our right. We pass through a quarry and make our way to the road at Wetton. We turn left passing the telephone box, church and pub then we turn right at the road sign for Grindon. We keep to the road passing the car park and toilets on our right and take the next right at the road sign for Wetton Mill. We walk to the end of the road and turn left and after about 100 yards we take the track on the left next to a gate sign posted Concession Path to Thor’s Cave. We walk to the end of the track, cross over the stile on the right then walk over two fields to go through a gate. We take the lower path to the right which leads us to the entrance of Thor’s Cave. On leaving Thor’s Cave we turn right and immediately left down the steps to the bottom and over the bridge back to the Manifold Way. We turn left and follow the track back to the car park. This is an easy to moderate walk with some steep inclines and declines along tracks and paths, through fields and on minor roads. Approx 7.25 miles allow 3 – 3½ hours using OS Explorer map OL24, The Peak District, White Peak Area. Start point: In the free car park next to Weag’s Bridge on the road to Grindon south of Wetton. The Manifold Valley in the Peak District, North Staffordshire. From Buxton take the A515 through Newhaven then after the turn off on the left for Alsop en le Dale take the next right and head for Milldale, Hope then at Wetton take the road to Grindon and the car park is just over Weag’s Bridge on the right. It is a large free car park next to the river on the Manifold Way. There are public toilets in the free car park at Wetton and at Wetton Mill. For refreshments there is the Ye Olde Royal Oak at Wetton, a cafe at Wetton Mill. There is a car park and Visitor Centre with toilets and picnic area and also a pub, the Manifold Inn, at Hulme End approx one mile north of Ecton. Hiya, Is there a free map i could use to navigate my way around this route? If you take a look at the walk on our website, walkingwiththetaxidriver, you will find a map and instructions of the route to print off. You could also watch the video again so that you could then recognise points and landmarks as you walk along. This is a fantastic walk hope you enjoy. Just wanted to say a massive thank you for doing this site and for all the work/expense involved. We’ve just got in from a walk around this route and granted we did get a little lost but we thoroughly enjoyed it!